The Orange-cheeked Parrots (Gypopsitta barrabandi aurantiigena), also known as Barraband's Parrots, are endemic to the subtropical or tropical moist lowland forest areas in Eastern Amazonas, Brazil, Southern Venezuela, Southern Bolivia, Ecuador, Peru, and West to Eastern Colombia. 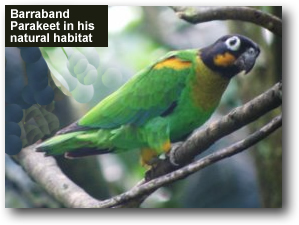 The Barrabands are quiet aviary birds and have an endearingly friendly and gentle personality. They are highly social and should be kept with a mate or in a group environment. In the wild, Barrabands are almost always found in flocks. They acclimatize fairly easily to a new environment and are very hardy. Barrabands average 10 inches (25 cm) in length - from head to tip of the tail. The plumage is generally green. The head is black; the cheeks orange-yellow; the breast and throat olive-yellow; the thighs are yellow; the bend of wing and lesser wing-coverts are orange yellow-red. The edge of the wing and under wing-coverts are orange-red. The primaries (longest wing feathers) and primary wing feathers are virtually black. The middle tail-feathers have a blue tip. The outer tail-feathers have yellow markings to the inner webs. The bill is blackish and the ring around the eyes is whitish. Their irides (= plural of iris) are dark brown and the feet grey. Females are sexually mature at one year of age and males at two years. Immatures have a paler coloring to their head. The forehead, nape, cheeks and chin are olive interspersed with brown. The bend of the wing and wing-coverts are green with a few yellow feathers. The edge of the wing and under wing-coverts are interspersed with green. Barrabands are hardy and will do well on a diet consisting of a quality seed mix and fresh fruits, vegetables and greenfood. Recommendations for bird diet / bird nutrition. If they are kept in an outside aviary, they need to be wormed regularly. They are also susceptible to foot problems and eye infections caused by fright and general emotional stress. A spacious, planted aviary that allows them to fly and exercise is recommended. They should be kept in pairs or in small groups, as they are social birds. Breeding Superb Parrots require a nesting box - dimensions: 60 cm x 20 cm by 20 cm; or a hollow log of at least 20 cm in diameter. The nest box or log should be lined with wood shavings. Their breeding season in captivity usually commences in March. In their natural habitat they breed between September to December and nest in tree hollows. Some pairs may breed twice a year, while others won't breed at all. The male's courtship display is characterized by his dilated pupils, raised head feathers, bobbing head, spread tail, and open wings. He runs back and forth in front of his female and contracts his pupils alternately. The hen lays a clutch consists of four to six eggs, which she incubates for about 20 days. The male helps in raising the young. The chicks fledge when they are about 35 to 45 days old and usually are independent by 50 days. Soft insect food is appropriate for hand rearing Superb Parrots. They acquire their adult coloration anywhere from six to ten months of age. 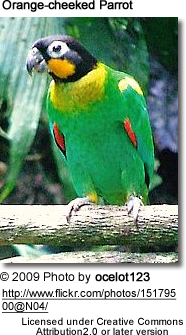 Description: Looks like the Barraband Parrot (barrabandi), described and featured above, but the cheeks, bend of wing, edge of wing, lesser wing-coverts and thighs orange-red. They also average 10 inches (25 cm) in length (including tail).